Hold My Hand and We'll Be Safe is a combination of live animation, mechanical child's toy and peepshow. It begins with simple child's play then becomes something a little more unexpected. A basic plywood box sits in the gallery. As viewers approach they can see a large peephole at the front of the box. A set of headphones dangles from the box, and there is a handle on its side. 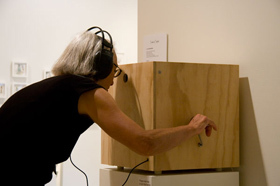 Viewers put on the headphones, peer inside, and turn the handle. They see shadows of a boy and a girl in a strange cave-like setting, the boy holding a skipping rope. As they turn the handle the boy skips, his movement getting faster and more frantic as the handle is turned. The sound viewers hear begins by sounding quite naturalistic, but the more they listen the more mechanical and strange it becomes. As the viewer turns the handle and gets into a rhythm the boy's skipping begins to seem more and more like a macabre dance in which he is trapped. As with her earlier interactive works such as Expecting (where clicking on a teddy bear shaped computer mouse causes a child to give birth to a playmate) and What Big Eyes You Have (where the crank of a handle animates nightmarish shadows in a child's bedroom), Sowerwine creates artworks that play with tensions between seemingly opposite forces such as light and darkness, danger and safety, the benign and the malignant. Her artworks use the symbols of play - populated as they are with dolls and cubby houses, peepholes and wind up mechanisms. The audience is enticed not only to look, but to engage. It's only once we begin to play, that Sowerwine turns the tables on us. Her toys become dangerous, her dolls lose their sweetness. Sowerwine's artwork spans animation, installation, interactives and photography. She is particularly interested in exploring the dark underside of idealised notions of childhood, and the possibilities of a sudden slippage from the familiar into the unknown. With her animated doll characters, she creates domestic scenes that show children as both witness and instigator of violence, and she combines cuteness and vulnerability with a use of scale that produces a child as monster. In her series Sharper Than A Serpent's Tooth (2005), shown at Stills Gallery, Sowerwine continued these investigations through a series of large photos of miniature domestic scenes. Sowerwine painstakingly made each of her subjects and their settings before photographing the scenes. Sowerwine has exhibited widely both nationally and internationally. In 2009, she had a solo exhibition at Western Plains Cultural Centre Dubbo and was included in the group show Trouble in Toyland, Counihan Gallery, Melbourne. In 2008 her work featured in International Digital Art, Songzhuang Art Museum, Beijing, and she exhibited at Art Cologne 2006 and screened work in Sundance Film Festival, USA. Her animated installation (with Clara animator Isobel Knowles) Expecting toured around Australia in 2004/2005 as part of the Experimenta: House of Tomorrow exhibition. Her previous interactive Play With Me (2002) was selected for the inaugural Anne Landa Award (2004/2005) at the Art Gallery of NSW - the first award-exhibition for the moving image and new media in Australia. Both interactives Expecting and Play With Me have also been shown as part of Media City Seoul 2004, the Korean biennale of new media art. Her animation Gillian was highly commended in the 2001 Dendy Awards as part of the Sydney Film Festival, and won Best Animation at the National Student Film and Video festival, and was screened at NewFest 2003 in New York.